APPLICATION PROCESS: In order to be eligible for the educational seminar in Syria, participants must submit a CV (or resume), a personal statement of no more than one page explaining why they want to participate in the course and a photocopy of their passport to crdc@gmu.eduno later than Thursday September 30th at 5:00pm EST. Space is limited. Priority will be given to early applicants so apply now. 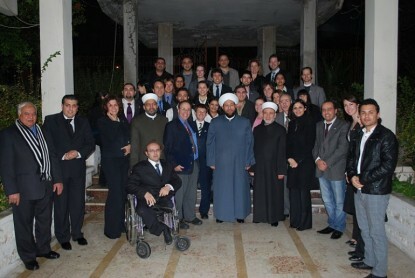 ELIGIBILITY: Reflection in Practice in Syria is open to all Mason and non-Mason Bachelors, MS and PhD students as a 3 credit course and to non-students as a professional development seminar. Mason students can take the course as CONF 713, 697, 399 or 385. (Other options may be available – Check with your advisor). Description: Reflective practice is the process of exploring a pattern of action, making adjustments during the action, or thinking about past action. In an elemental sense, most of us perform some form of reflective practice virtually every day. To the extent that reflective practice incorporates theory and experience, even the most mundane of activities engages aspects of experiential learning and nascent theory. Conflict resolution is frequently a process that involves emotional intensity and relational complexity. This can be a factor in dyadic disputes, but is significantly present in deep-rooted multiparty conflicts. Because of this, it is critical that practitioners be skilled at integrating theory and experiential learning into practice at three stages of an intervention: (i) in analyzing or assessing the conflict in preparation for intervention; (ii) during the intervention itself; (iii) and post intervention reflection. In this way, reflective practice is a form of “meaning making”, attempting to make sense of phenomena occurring around you through an interdependence of theory, experience and practice. Utilizing a uniquely challenging experience of fieldwork you will have the opportunity to engage aspects of reflective practice as noted above. The objective is to build an understanding of integrative practice that can be utilized in a variety of conflict settings. The Syria Seminar is an intense experience in an environment that becomes practice and reflection the moment one enters Syria. The study and engagements are all in the shadow of a paradoxical combination of wonderful hospitality, fascinating people, and a complicated and intensely controlled political and security environment. There is a need to measure one’s every word and action in order to honor and protect indigenous people, as well effectively practice citizen diplomacy and peacebuilding. Before, during, and after this trip the student experiences reflective practice at every moment, and the assignments are geared in this way precisely. The model is a combination of intensive classroom study, speakers from the local region, touring of Damascus and the countryside, extensive field experience engaging communities across the Syrian spectrum day and night, combined with preparation meetings, follow up meetings, and individual and peer help with papers. *Program fee includes double-occupancy hotel lodging (a single room can be purchased for an additional $350.00), daily breakfast; all lunches and some dinners; in-country ground transportation; cultural excursions; course trainers and speakers costs; international airfare from DC but NOT tuition. Tuition rates can be found on the George Mason University website (course can be take with or without college credit). Day trips include: Sednaya, Ma’alula and Palmyre. Group airfare is only included in the price for those who register by 9/30. At that point, the course fee will be lowered by $1000 to $1,995.00 and participants will be responsible for their own international airfare. Ha’aretz Online Newspaper; positive messages sent across enemy lines by Grand Mufti of Syria to people of Israel as a result of 2010 CRDC class diplomacy!! Detailed account of the course experiences from homepage of Mason website.